•	BOHEMIAN THEME: Inspired by the love you share these silk rose petals, table confetti, will bring a certain charm and a whole lot of ambiance to your special event or celebration. •	PETALS: This package of table scatter decorations includes 100 petals, perfect for decorating table centerpieces, and so on for engagements, weddings, bridal showers, boho chic parties and so much more! 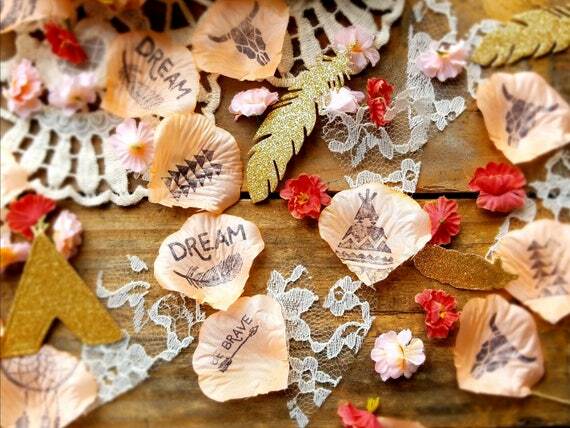 •	100% HANDMADE: Our hand dyed soft coral rose petals have been hand-stamped with a variety of bohemian themed images.
. 6 different stamped images on 100 confetti and are coral color.
. 21 glitter pieces, 7 tepees and 7 of each style of feathers. Each confetti piece measures approx. 1 .75"